Playsilks are simply pieces of beautiful colored cloth that are used to make capes, skirts, and doll carriers, over and over again in different combination. Blue silks can be spread on the floor to "sail" boats on; green can be grass for horses to "graze" on. These toys are sustainable, eco-friendly and reusable so moms feel good about having them around the house. Sarah's Silks is proud to be Green America certified. Launch date: July 2011. ZOMBIEZOO is a family of fun loving animals including Boo the black cat, the natural born leader of the group, and Stich, a pig obsessed with hygiene. Along with their friends, Muck, the “party animal” monkey, Rob the poetic rabbit and Toxic the competitive red snake. These new Mini ZOMBIEZOO clip-on plush are 4" replicas of Boo, Muck, Rob, Stich & Toxic are made out of soft velboa fabric. With a red hook they are great to hook onto a keychain or backpack. "Completely unique, ZOMBIEZOO combines the pop culture icon of zombies with adorable animals. ZOMBIEZOO offers non-violent and safe products for the tiny, budding monster lover," Neecy Twinem, Creator/Zookeeper at ZombieZoo, told TDmonthly. Launch date: September 2011. Meet the award winning collectible Piggy Wiggie Family. Each Piggy Wiggie has a unique personality and comes with its own little story. With big ears and a cute button nose, they really will bring a smile to everyone's face. Each Piggy Wiggie is handmade, and no two are exactly the same. Launch date: February 2011. The Sweet Pea Collection is an adorable collectible range of Mini Piggy Wiggie Keychains. You can clip them on your school bag, on your car keys in fact take them everywhere you go. Each Mini Piggy is made from a pair of socks and comes with a name and a story. Mini Piggy Wiggie keychains make great gifts and come in beautifully designed gift boxes. Each character is named after a family member of the designer. Launch date: February 2011. SANTA SNORZ has joined the Piggy Wiggie Family. Handmade from a pair of socks, he makes an ideal gift for family and friends, and a perfect little stocking stuffer too. Launch date: November 2011. Coloraturo, a new block set created by award winning toy designer Karen Hewitt, will delight and captivate the imagination of children and artists of all ages. This smart toy functions both as a designer art piece and a high quality children’s building toy providing endless experiences with color in both two and three dimensions. The color, form and sheer beauty of Coloraturo will attract young children as well as architects, designers and playful adults. "Displaying 36 unique, vibrant colors, this piece stands out from ordinary block sets, yet will still be a timeless toy for generations of children. This toy will provide endless building opportunities, yet looks beautiful enough to display anywhere in the house," Karen Hewitt, president/designer of Learning Materials Workshop, told TDmonthly. Launch date: September 2011. Awards: TDmonthly Top Toy Award, January 2012; 2011 Dr. Toy 10 Best Creative Products Award; 2011 Dr. Toy 100 Best Children's Products Award. — Why it won: Beautifully designed, kids can enjoy hours of pattern play, color sorting, and building. 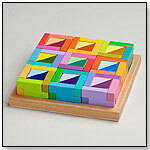 Meanwhile, parents won't mind having these colorful, geometric blocks left lying around. Spuzzle is a fun-filled race to see who can finish their puzzles first. Designed for children, this game will challenges kids to finish their five puzzles first. Includes 5 sets of 20 puzzle pieces (blue, yellow, purple and red), 1 game board, 28 Spuzzle cards, and Instructions. Awards: PTPA Seal of Approval, Creative Child Magazine Preferred Choice Award, National Parenting Center Seal of Approval. Codigo Cube is a socially interactive trivia game that uses players' web-enabled camera phone, a free app, and a patent-pending 2D bar-coded die. Codigo Cube is updated with new questions daily. Whenever breaking news happens Codigo Cube gets updated. Playing is fun and easy. Players simply download a free QR code reader for their phone, then scan any side of the cube. Roll the cube, scan the code, and answer the question from a list of four multiple choice answers. Guess correctly and re-roll. Guess wrong and the cube is passed to the next player. Launch date: October 2011. Awards: TDmonthly Top Toy Award, January 2012; 2011/2012 The Toy Man Award of Excellence; 2011/2012 The Toy Man eChoice Award; 2011 The Toy Man Top 50 Toy Of The Year Award. — Why it won: Codigo Cube is harnessing new technology for an innovative and inexpensive new game. Players simply scan the QR code on the die with their Smartphone to access a trivia question online. The trivia questions are constantly being updated, so the game never gets old. — As of 9/21/2012 this product had 4.7 out of 5 stars from 23 reviews on Amazon.com. Pros: Easy to use; more variety than a traditional trivia game because questions are always being updated. Cons: Needs to be played in a well-lit area or the QR code readers can scan the codes properly. Whoowasit? is an interactive board game with an exciting electronic feature. Players must find the magical ring that was stolen from the wise king by a castle resident under the spell of the evil wizard. Playing against the clock, players move through the castle rooms to uncover clues to who stole the precious gem. 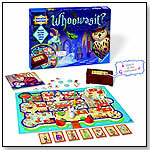 Along the way, talking animals help players solve the mystery of the stolen ring with the help of a treasure chest that randomly supplies clues on behalf of the animals. Players must seek food, communicate with and then feed the animals to receive clues that help eliminate the suspects. Whoowasit? helps reinforce memory, tactical and teambuilding skills. Playing time 40 minutes. Contents 1 game board, 4 doors (to place on the board), 1 electronic chest, 4 playing pieces (red, yellow, green, blue), 1 ghost, 1 cat (game board), 9 food tokens, 4 key tokens, 10 suspect cards, 1 die, 1 ring, 1 ring base. Blocks by brinca dada were designed to engage kids and adults. Unlike other blocks that fit together simply, these blocks are designed to conflict. We play with the simplicity of imperfection. They are a puzzle with infinite solutions. They are spontaneous, not pre-programmed--the opposite of video games. Handmade of teak hardwood. Launch date: November 2011. Viewing products 321—330 out of 1181 products.